Thanks so much for stopping by my blog, I'm following and subscribing back. I'm follower #201! And have subscribed also. Happy Feed Me Friday! Hi! 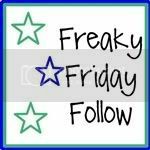 I'm a new GFC follower from Toddler Awesome's Friendly Friday Follow. I'd love if you'd follow back! Also, I host a blog hop on Sunday by the name of Sunday Followed & Featured. I'd love if you'd share about it and participate for a chance at winning a $20. Gift Card. The link to my blog is http://giveaways4mommy.com Hope to see you there! I am blog hopping today and decided to stop by your blog. Hope you will stop by and follow either or both of my blogs.